U.S.A.: Crest, 1990. 213 pp. A true-life collection of baffling and bizarre medical mysteries, told by the doctor who solved them. Softcover has very little wear, no creases. Former owner's name written in pen on first page. Text is clean, tight and unmarked. A nice copy.. Mass Market Paperback. V. Good. Don Mills, Ontario: General, 1982. 197 pp. 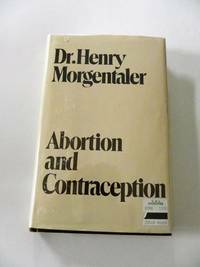 Dr. Morgentaler discusses the pracical, legal, religious and moral question about abortion. Covers the reproductive system and the first signs of pregnancy, embryological development, methods used to induce abortions, possible complications, abortion and the law. DJ has a tear 1/2" to top near spine. Price sticker on lower front corner. Some scuffing to front cover. Not price clipped. Looks good in new mylar cover. Brown paper on boards binding is in excellent condition. No former owner's name. Text is clean, secure, unmarked. A nice copy.. HC and DJ. Very Good +/Good-V. Good.